The Global News TV network in Canada just put up a long, well-ballyhooed online story about polyamory. It's the second in an five-part series called State of the Union, "a new Global News series that will examine alternative relationships in Canada and show that no matter what, love is love." 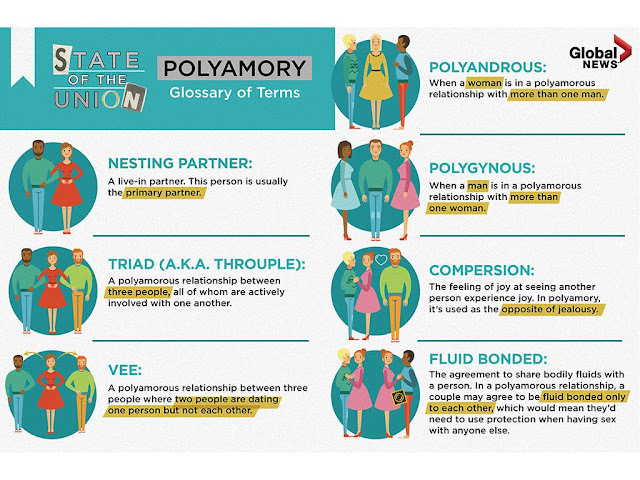 1) Plenty of people are solo poly, in a triad or more, RA (relationship anarchist), in their own unique structure, and other forms that viewers should know about beyond couple-plus. 2) More importantly, when a couple tries to go couple-plus, they're often blindsided when their own relationship inevitably changes to something different. For the better, they may hope, but don't go into this with the illusion that you're just adding a new hobby to your mono partnership. If that's what you want, you should look into swinging instead. Most of us were brought up steeped in the monogamy paradigm, with its massive cultural baggage and unseen assumptions — and you'd better be prepared to look at them through the eyes of the social radical you've just become. That means putting the baggage down, examining it together and individually, and deciding what to keep and what to junk. Poly is not for everyone. For instance: When tough stuff happens, will a new partner be treated as a disposable thing or as a fully realized person with feelings and equal rights to good treatment? As Granny Weatherwax said, and as More Than Two repeats as a bedrock principle: "Sin, young man, is when you treat people like things." Failure to understand the social radicalism you have embarked on is, IMO, the number one cause of newly opened marriages not working. Not to mention the damage they can inflict on others. Polyamory is a world of ‘infinite’ love. But how do the relationships work? ...At the moment, [Darren] Ruckle has a new girlfriend, Laura, who’s going through a divorce, and she has a boyfriend who’s married. Harrington is also in the early stages of a new relationship with a woman who, coincidentally, Ruckle has known since they were six. She’s also married and has a boyfriend. No one could be faulted for needing to draw a family tree of sorts to understand the intricate web of relationships, but make no mistake, they are all connected in their own way. Ruckle has met and befriended Harrington’s past partners, and although he has yet to meet Laura’s boyfriend, Don, he will in time. For their part, Laura and Don often hang out with his other partner and spouse. It sounds awfully complicated and like a lot of extra responsibility — after all, relationships require work. Surely, the more people you add to the mix, the more effort needs to be poured into maintaining each relationship. ...What the poly community strives to get across is that they’re not swingers who are trying to satisfy some insatiable sexual need or sow their proverbial oats. Rather, they’re people seeking out multiple romantic, meaningful connections with different people who can meet different needs. An Ipsos poll exclusively commissioned by Global News surveyed 1,501 Canadians and found polyamory to be gaining steam in certain relationship models. One in 25 respondents (four per cent) who are in a relationship described it as polyamorous. The marriage scenarios in which couples were most likely to be polyamorous were arranged marriages (27 per cent) and mixed orientation relationships, where one spouse is straight and the other is gay or bisexual (23 per cent). 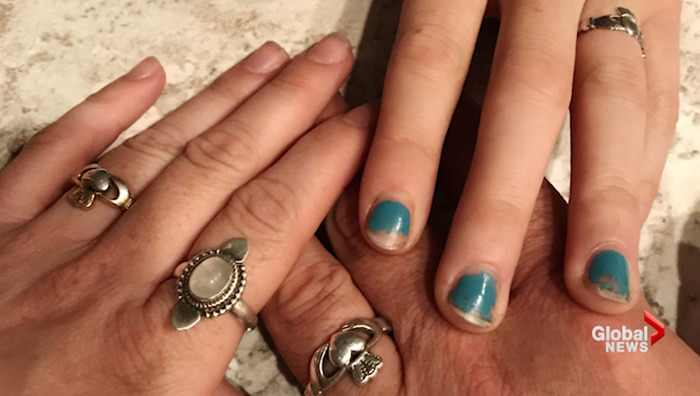 Blended families are nothing new today (especially not with a national divorce rate of 48 per cent) and co-parenting is a reality for many, even in polyamorous households. Except unlike scenarios of divorce and remarriage, where the adjustment period can be fraught with power struggles, polyamorous families tend to take a more communal approach. Not only do children in these scenarios feel safer and more secure, she says, they’re also exposed to role modelling from adults who are less hierarchical in terms of traditional marriage expectations. And for some kids, it also means that they can have all their problems fixed under one roof. Zoe Duff, 59, is the spokesperson for the CPAA. She is in a relationship with two men, her nesting partner of 19 years and her other partner of nine years. When their families first came together, Duff and her nesting partner had eight children between them. And her kids, in particular, loved having two dads. Ruckle and Harrington also pitched in with their now-ex partner’s child, taking turns doing school runs and offering advice when it was required. In fact, he says, the child remains very attached to them both. In a 20-year study examining children in polyamorous families, Dr. Elisabeth Sheff, a global academic expert on polyamory, found that although children raised in poly households experienced a range of advantages, including learning open communication strategies and gaining a deeper sense of trust in their parents, they also experience disadvantages. These disadvantages are both practical — lack of privacy, an overcrowded home and increased supervision — and emotional, including social stigma, discrimination from others and the desire for a “normal” family. When it comes to arrangements and responsibilities, each polyamorous household has its own unique set of rules and agreements. For example, in Duff’s house, each member of the triad has their own bedroom, whereas Ruckle and Harrington shared their king-size bed with their last partner. For people who are monogamous, perhaps the biggest and most insurmountable obstacle to a life of polyamory would be jealousy. But that doesn’t mean polyamorous people are immune to it. Instead of focusing on feelings of jealousy, however, the polyamorous community upholds the concept of compersion. It’s the act of revelling in the joy that you see your partner experiencing at having a new partner in their life. Read the whole thing (July 24, 2018). The other four "alternative relationship models" in the five-part series are sexless couples, mixed orientation marriages, arranged marriages, and couples living apart by choice. ● The article prompted a 6-minute segment on a morning news-radio show about polyamory ("yes, I know we all had to google it," says a host). The hosts talk to psychiatrist Marcia Sirota, who does a fine job of explaining what we're about. Listen here (CHQR radio, July 24). ● And in related news, now available is researcher John-Paul Boyd's 160-page report Perceptions of Polyamory in Canada from the Canadian Research Institute for Law and the Family. It's based on surveys returned by 480 poly people recruited through the community (PDF download; dated December 2017). A "nesting partner" is someone you cohabit intimately with, but with who you do not engage in common "relationship escalator" behaviors (progression to marriage, blending finances, identifying as a couple, shared-bedroom cohabitation, etc. ), poly-hierarchy or couple-centrism. It's a way of indicating a cohabiting partnership, while also indicating you do not engage in constructs that are often assumed of cohabiting lovers. This term was intentionally introduced into Poly culture in the late 1990s when it became evident that “primary partner” no longer only indicated who you live with, but expanded to also mean “this person is #1.....the most important...and all other lovers will take a back seat to them.” Those of us who engage in a more independent and autonomous form of polyamory chose this way of referring to our cohabiting partnerships - where couple-centrism and poly-hierarchy aren’t part of how we related with others - in order to have an identity term that sets us apart from couple-centric/hierarchical dynamics and to communicate clearly that we do not engage in such limiting constructs. Essentially nesting partners are people who tend to lean strongly toward solo-poly and Relationship Fluidity (sometimes referred to as Relationship Anarchy). It is not simply a cute or alternative way for referring to one’s “primary”, given that we reject such dynamics. It’s our identity term.....and making sure it’s used properly - and not mistakenly appropriated - is very important to us!